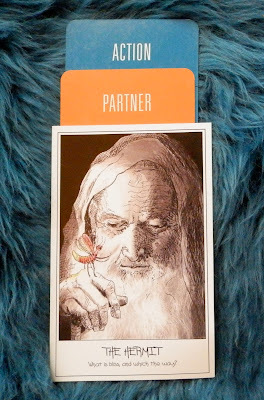 Today's Draw: The Hermit from the Pen Tarot in the Action to Take With Your Partner position from the Deck of 1000 Spreads. Does your partner sometimes feel "absent"? Whether single or attached, do you often feel lonely? When was the last time you took as good care of yourself as you do everyone else? Learn to be alone when you're together and together when you're alone. You really have to put some thought into that for it to sink in. Being alone when you're together is about having separate interests and not depending on the other person to fill your time....or fill your life. I think that's an easy trap people fall into when they get married or coupled. They think "now I'll never have to be alone". They stop pursuing singular interests because they feel being married means you turn your time over to your partner. In some cases, being partnered for some is a way out of ever having to be alone with oneself and look within. The truth is, however, that there's never a circumstance in your life in which you won't have to be alone. Moreover, you may have others gathered all around you and still FEEL alone if you lose your identity and your singularity to a relationship. Life is a solitary journey. And we can have companions along the way, but we can't push the responsibility of driving our journey off on anyone else. Well, we can, but we won't get far. We came here for a purpose that serves our soul and we need to nurture that relationship, too, in order to fulfill our purpose. Another thing I see especially women doing is putting everything "me" aside for their children. Of course there's a line you need to walk, but for some it seems like being alone and having alone things to do is a betrayal to the children. They feel like they have to be there and be available to the children at all times. But what they're really doing is teaching their children how to abandon their own needs for the needs of others further on in their lives...that the only time someone's needs are important is when they're children. Either that or they're setting their children up for disappointment in a world that doesn't stop to handle their every need. In my opinion, being alone—being singular and nurturing an identity that doesn't revolve around anyone else—is a skill we all need to master in our lives, just as being with others is. Neither of those skills should be left to atrophy in a lifetime. Whenever you FEEL lonely in life, it's wise to ask which of those two things you've been neglecting. The second part of "learn to be alone when you're together and together when you're alone" is the ability to carry another in your heart and consider them even if they're not there. Again, you don't want to be so dependent on someone that you have to be with them physically to feel their love, nor do you want to be so independent that they and their needs cease to exist when you're not together. But you do want to be able to venture out in your aloneness without feeling lonely. As a person who spends a lot of time alone, being together when you're alone is important in any kind of relationship. When you're navigating life as a single person, it's easy to feel alone when you're not. There are plenty of people out there to reach out to if you let yourself do that. Ultimately, the words on this Hermit card sum it up, "what is bliss, and which the way?" Bliss can happen in many ways in our lives. It can come through another and it can also come through ourselves. We owe it to ourselves and others to nourish and model both ways. Both are tools essential to life.